During my conversations with Caroline Le Breton – who I invited to collaborate with me on the development of ways of thinking about space and décor in relation to the exhibition – she said, ‘something like walking into a collage’, and that phrase remains the way in which we will approach the installation process. House of Life is about found images; in many cases they are photographic. However, not all the works are two dimensional. 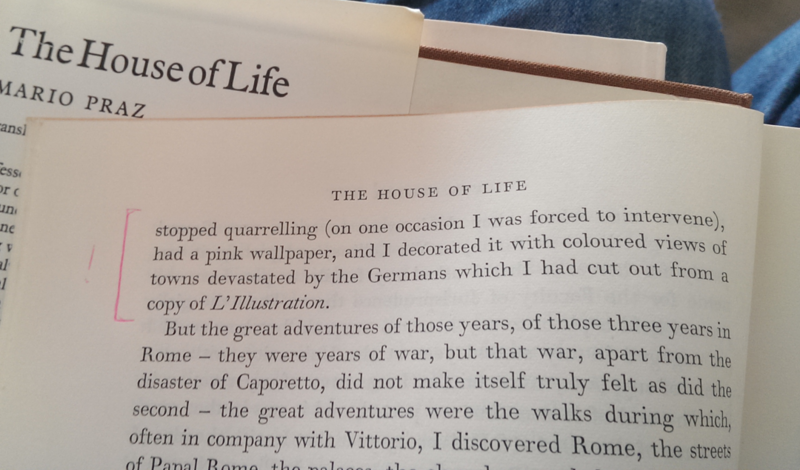 Over time I came to think of the house of life as the frame of the image, a space- both physical and imaginary- which holds within it not only the image, taken from life, but also life, a reanimation of something which had been passed over in some way, as a result time, technology, neglect. Some years ago I found a small greenish-grey folding table – with a built in bookshelf– discarded on the street in Antwerp. I’ve had it at home ever since. This has been reproduced in multiple for the exhibition, painted now in pink, Milk Thistle, after a colour instruction from Marc Camille Chaimowicz as a response to the Mario Praz quote. Thus, the pink has transferred from the Praz wallpaper to the tables and the destruction of the images of war-torn Europe became a relation to the fragment. Some works are pinned or hung, other lie or lean on the tales or shelves. Paper, printed matter, books, but also furniture and décor. A House of Life.